WASHINGTON (Reuters) - President Donald Trump suggested challenging licenses for NBC and other broadcast news networks on Wednesday, a salvo that followed reports his own secretary of state had called him a "moron" after a discussion of the U.S. nuclear arsenal. "With all of the Fake News coming out of NBC and the Networks, at what point is it appropriate to challenge their License? Bad for country!" Trump, a Republican, wrote in a post on Twitter. Trump and his supporters have repeatedly used the term "fake news" to cast doubt on critical media reports about his administration, often without providing any evidence to support their case that the reports were untrue. Trump kept up his criticism of the media in an appearance with Canadian Prime Minister Justin Trudeau on Wednesday, saying: "It is frankly disgusting the press is able to write whatever it wants to write." Any move to challenge media companies' licenses, however, would likely face significant hurdles. Comcast Corp, which owns NBC Universal, also owns 11 broadcast stations, including outlets in New York, Washington, Los Angeles, San Francisco, Boston, Dallas and Chicago. 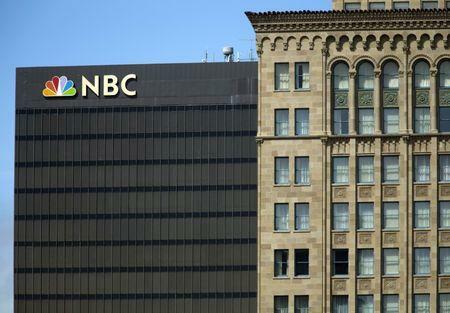 A Comcast spokeswoman referred questions to NBC, which did not immediately Wednesday. Shares in media companies fell after Trump's tweet, potentially reflecting concerns the war of words could escalate. Comcast was down 0.8 percent, while Disney shed 1.4 percent. CBS Corp fell 1.2 percent and Twenty-First Century Fox slid 2.8 percent. Recon Analytics analyst Roger Entner called the market response a "short-term irrational knee-jerk reaction" and said Trump faced essentially insurmountable hurdles to getting licenses pulled. Gordon Smith, the chief executive of the National Association of Broadcasters, defended the media's free speech rights. "It is contrary to this fundamental right for any government official to threaten the revocation of an FCC license simply because of a disagreement with the reporting of a journalist," he said in a statement. Numerous Democrats criticized Trump and urged Pai to denounce Trump's comments. Senator Ed Markey wrote Pai on Wednesday asking him to "withstand any urges from President Trump to harm the news media and infringe upon the First Amendment," a reference to the U.S. Constitution's free speech and press freedom guarantee. Democratic U.S. Representative Frank Pallone said Trump "seemed to threaten broadcasters’ licenses only because he disagreed with their reporting. This threat alone could intimidate the press and lead to skewed and unfair reporting." FCC Commissioner Jessica Rosenworcel responded to Trump by tweeting a link to an FCC fact sheet. "Not how it works," she said on Twitter. The FCC said in the fact sheet it expects "station licensees to be aware of the important problems and issues facing their local communities and to foster public understanding by presenting programming that relates to those local issues." The agency does not issue similar licenses for cable networks like CNN and MSNBC, or regulate internet news or other websites. The FCC has said the First Amendment "expressly prohibits the commission from censoring broadcast matter" and that its role "in overseeing program content is very limited." In the early 1970s, then-President Richard Nixon and his top aides discussed using the FCC's license renewal process as a way of punishing the Washington Post for its coverage of the Watergate burglary that ultimately brought down his presidency. NBC News has reported on tensions between Trump and Secretary of State Rex Tillerson, and has said Trump sought a dramatic increase in the U.S. nuclear arsenal during a meeting with national security advisers in July. NBC reported Tillerson made his "moron" comment after that meeting. Trump on Saturday also suggested he should get "equal time" because of what he described as late-night television hosts' "anti-Trump" material. The FCC's equal time rules apply in limited cases to air time for political candidates and not to criticism of elected leaders. Trump may have been referring to the "Fairness Doctrine" that was designed to ensure broadcasters present opposing viewpoints about public issues. Republican President Ronald Reagan's administration eliminated it in 1987.